Once again Swedish trio Daybehavior shows their massive skill in quality songwriting and top-notch production. This time Julian Brandt (former member of Kamera, Bobby, solo-career and currently, (May 2013), in a project with Marina Schiptjenko (Page)) visits on guest vocals in this stunning duet with Paulinda. The B-side of the single "Luci Della Citta" is a new recording sung by Paulinda in italian. Available at iTunes https://itunes.apple.com/us/album/for-a-thousand-years-single/id639902549 Amazon http://www.amazon.com/gp/product/B00CIM9PZE/ref=dm_att_alb2 "For a Thousand Years" is taken from the album "Follow That Car!" 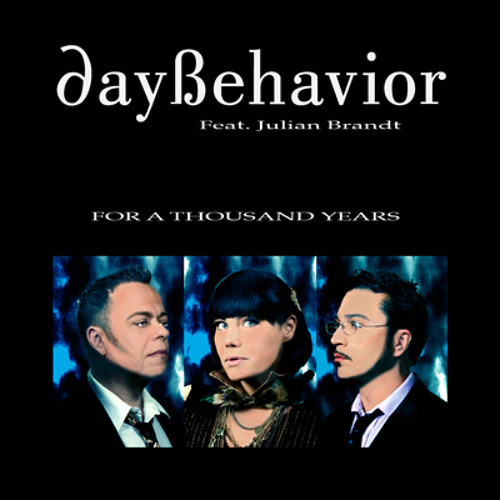 (Graplur 2012) Also available as old fashion Compact Disc.... http://www.daybehavior.com/store DAYBEHAVIOR WILL RETURN IN " BASED ON A TRUE STORY "
A brilliant song with an excellent balance of electronics. Subtle, allows your voice to shine!